A fake Georgian TV news report breathlessly detailing a massive Russian invasion of Georgia appeared so terrifyingly real that it caused cellphone networks to crash while thousands of people poured into the streets of Tbilisi and other cities to besiege ATM machines, food stores, and gas stations. Doctored videotapes played on Georgia's pro-government Imedi TV Saturday night showed Russian President Dmitri Medvedev allegedly ordering the invasion and a breathless update reported that Georgian President Mikhael Saakashvili had been assassinated. 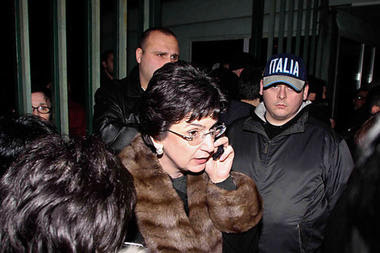 The Georgian opposition, painted as traitorous supporters of the fake Russian invasion in the broadcast, was outraged, perhaps no one more so than Nino Burdzhanadze. Ms. Burzahanadze, who last week traveled to Moscow to explore the possibility for political dialogue with Russian Prime Minister Vladimir Putin, was described as the head of a Russian-installed "peoples' government" at the end of the fictional broadcast. Burdzhanadze says she deeply resents being depicted as a "pro-Russia traitor" and warned that she intends to sue Imedi in a Georgian court. In a telephone interview, Burdzhanadze said she believes that Saakashvili ordered the broadcast as a propaganda exercise to sow anti-Russian panic and tar Georgia's opposition, which has been calling for his resignation for more than a year with the brush of alleged disloyalty. "Everything seemed so believable that I didn't doubt it was true," says Shorena Lortkipanidze, an expert with the independent Center for Conflict and Negotiation in Tbilisi, who was alone in her Tbilisi flat with her three young children when she watched the frighteningly realistic "simulation" about a hypothetical repeat of 2008's Russo-Georgian war. "Imedi is a serious news station, with a lot of credibility, and there was nothing on the screen to say this was all hypothetical," she says. "It said that Tbilisi was going to be bombed. I panicked, and my only thought was, 'How will I save my children?' "
It says a lot that a professional political analyst like Ms. Lortkipanidze was taken in by the 20-minute broadcast, which reported that Russian tanks had burst out of the pro-Moscow enclave of South Ossetia and were racing toward Tbilisi while Russian bombers were pounding the country's airports and harbors At the end of the broadcast, a brief announcement informed viewers that it had been "a special report on possible future developments." The impact of the broadcast is already being compared to the infamous 1938 "War of the Worlds" hoax authored by Orson Welles, which sowed panic among some radio listeners and convinced thousands of Americans that the end of the world was at hand. "It's still impossible to understand what this was, some weird joke or a deliberate attempt to traumatize the population" for political purposes, says Mamuka Nebieridze, director of the independent Center for Euro-Atlantic Studies in Tbilisi.